Hashtags are words or multi-word phrases preceded by the # symbol, such as #picoftheday or #sweepstakes. People can search for posts with a specific hashtag, so they are used to categorize content and track topics on Twitter and other social media platforms including Facebook, Instagram, and Pinterest. Using hashtags helps people find posts and tweets that interest them. You add hashtags to your tweets, pins, or posts by using the pound symbol (#) followed by a word or phrase that defines the Tweet's topic. Don't use any spaces in your hashtag; if you need to use more than one word, simply run them together. If it's hard to read the meaning of the phrase without spaces, you can capitalize each word. For example, #throwbackthursday and #ElectionNight are examples of popular multi-word hashtags. How do you decide which hashtags to use? You can come up with a phrase that you find appropriate or you can use hashtags that you've seen other people put in their posts. If you're looking to attract readers, you can use a site like Hashtags.org to find hashtags that are currently popular (trending) on social media. Hashtags don't have to be about a topic; they can also encapsulate a mood in your post. For example, if you post about winning a prize, you could use the hashtags #soexcited and #lovewinning! Hashtags can also be sarcastic, ironic, or funny. You can include more than one hashtag in your Tweet, if appropriate, but beware of using too many hashtags. Once you get above three hashtags, or when your post has more hashtags than text in it, your post begins to look like spam and may turn off your readers. In the example above, "#Twitter" is a hashtag. 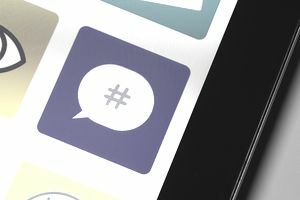 Hashtags are also known as #, tags, hash symbols, and hashes. There is an alternate spelling: hash tags. For a funny take on hashtags and how it would sound if people used them when they talked like they do when they Tweet, watch this hashtag sketch by Jimmy Fallon and Justin Timberlake. Hashtags didn't start with Twitter, but social media platforms have made them wildly popular. Hashes were used in programming languages and in IRC chat for decades before Twitter user FactoryJoe suggested bringing them to social media in 2007 with the tweet: "how do you feel about using # (pound) for groups. As in #barcamp [msg]?" It took another two years for Twitter to take the suggestion to heart, according to this article from AdWeek. In 2009, Twitter began linking hashtags to make them searchable by simply clicking on them. The next year, Twitter used hashtags to identify Trending Topics, which they posted on their homepage. As hashtags became more popular, other social media sites started to pick them up as well. You can find hashtags on Google Plus, Instagram, Facebook, Pinterest, and more. Why Do People Use Hashtags in Their Posts? With so many people posting on social media, it can be hard to find the posts you want to read and the people who discuss topics that interest you. There is so much information being posted at any one time that wading through them is time-consuming and many interesting things can be overlooked. If you search Twitter for those hashtags, you will receive a list of all of the recent posts people have made on those subjects. This is an excellent way to find new social media contests to enter which is important since many Twitter giveaways have a very short entry period. If you use a Twitter client like TweetDeck, you can set up permanent searches for topics that interest you, so that you have a constantly updated source of information. In some social media clients, you can also mute specific hashtags. So if you are sick of hearing about #sports or the #grexit, you can easily skip those posts in your feed. Many Twitter sweepstakes use hashtags to identify the entries into their giveaways. Sponsors see who entered by searching for hashtags they specify in their rules. To enter, you may be asked to answer a question, give an opinion, or share a story, followed by a specific hashtag to enter. Send a Tweet about your favorite summer memory followed by the hashtag #winningsummer to enter. When you enter these giveaways, you need to make sure that the giveaway's sponsor can see the posts you make to count your entry. Be sure that you haven't set your Twitter profile to private or you'll be wasting time entering. Hashtag sweepstakes on Instagram, Pinterest, and other social media platforms work in a similar way. Hashtags are a quick and easy way to find like-minded people to follow, to attract more people to the posts you make, and to enter giveaways and win fun prizes while injecting more personality into your posts. You can't really go wrong with them, so play around with them when you post on social media and see what kind of effects they bring!